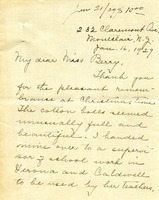 Martha Berry implores Elizabeth Brewster to return to Berry, offering her a choice of positions at the Girls' School or the college. Berry writes passionately of Brewster's beautiful spirit and of how much she is needed at Berry. 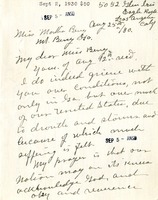 She tells Brewster that she cannot fully express herself in a letter but hopes that Brewster will read between the lines and that her prayers will lead her to return to Berry.